Degenerative Cultures is a “bhiobrid” (bio-digital hybrid) artwork in which living organisms, social networks and Artificial Intelligence work together to corrupt the human impulse to master nature. Replicating the logic of so-called “intelligent” microorganisms, the artists blur the limits between biological and artificial intelligence. Books that deal with the human desire to control nature serve as food for a colony of microorganisms. Next to the book with live fungi is a computer monitor. An intelligent digital fungus searches the Internet and corrupts texts with the same predatory intent – positing means of controlling nature. These two systems, one organic and the other informational, communicate through a digital interface. Degenerative Cultures is a “bhiobrid” (bio-digital hybrid) artwork, as it integrates living and digital systems in a single network. 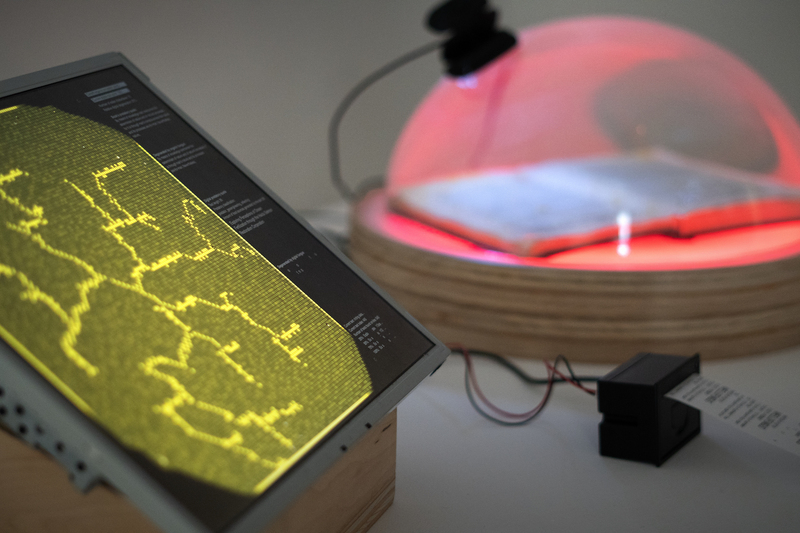 The digital fungus is an Artificial Intelligence with generative algorithms that are based on the growth of living organisms. 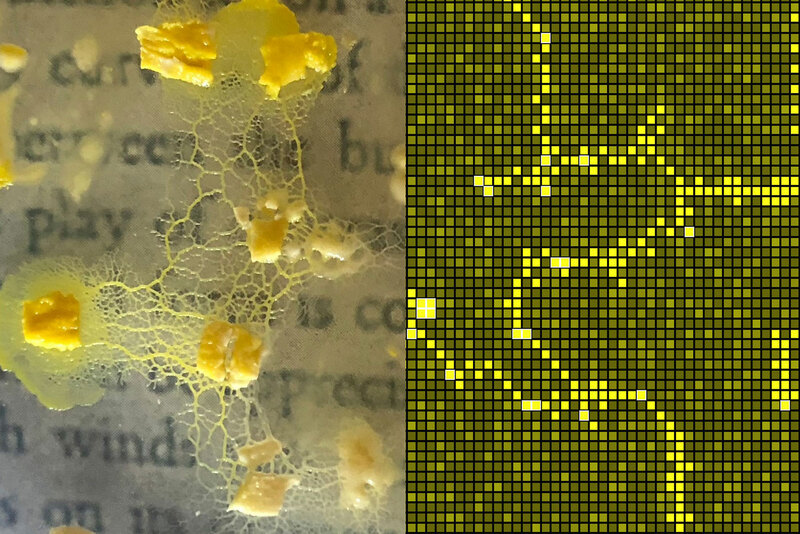 “Reading” the text live, Physarum polycephalum grows over the text of a real book, tweeting less legible editions as the organism covers and redacts the original passage. Anyone can interact with the system through twitter and help to destroy the database of texts that the digital fungus sources online. Humanity as a monolith, with a “Western” context, has long sought to control nature – a propensity that predates Modernity’s ideology of techno-science and extends from Cicero to today’s climate engineering. This behavior has been conceptualized, planned and justified through ideas such as progress, beauty, domestication, profit and the superiority of human beings throughout the ages, proliferated through Western religion, science, art, philosophy and economics. Degenerative Cultures critically examines these old and new texts, searching for patterns that could direct humanity to disinformation and corrupt the algorithms of Modernity. […] we alone have the power of controlling the most violent of nature’s offspring, the sea and the winds […] we confine the rivers and straighten or divert their courses. In fine, by means of our hands we essay to create as it were a second world within the world of nature. Cicero, De Natura Deorum, year 45 B.C. A network of deep and large channels can be dug […] in hot deserts as (hot as the) Sahara. When these channels are connected with the seas & oceans, a network of water channels is created in those deserts. In this way, the local climate of deserts will change because channel water is vaporized during daytime when air temperature reaches 50°C and condenses during nighttime when air temperature is around 0°C. Degenerative Cultures maps and corrupts the predatory knowledge frameworks that have consistently driven how humanity deals with nature. The resulting bio-digital system makes visible those entropic patterns in human culture that have carried us into the Anthropocene. Conceived and developed across continents, Degenerative Cultures began with this question: how can we push the relationship between human beings and nature and cross the different systems of communication inherent in technology and nature? What can we learn from the interactions across biological, social and technical networks? 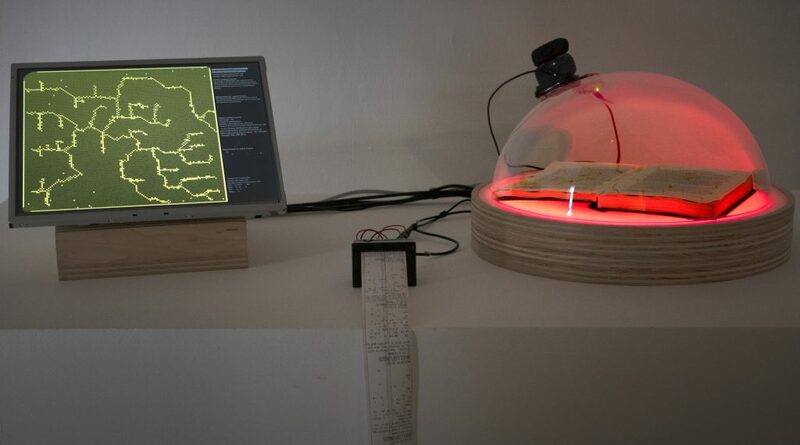 In the bhiobrid installation, physical books are used as the substrates for microorganisms. The text is destroyed in a physical sense, and this destruction is visible through the disappearance of legible text on the surface of the pages. The A.I. component analyzes the living microorganisms’ growth and feeds an algorithm linked to cellular automata and natural language analysis. This bio-digital agent searches the Internet and builds a database of texts on humanity’s efforts to control nature. Just as the physical book is consumed by the microbiological culture, the digital database is corrupted by the degenerative algorithm. 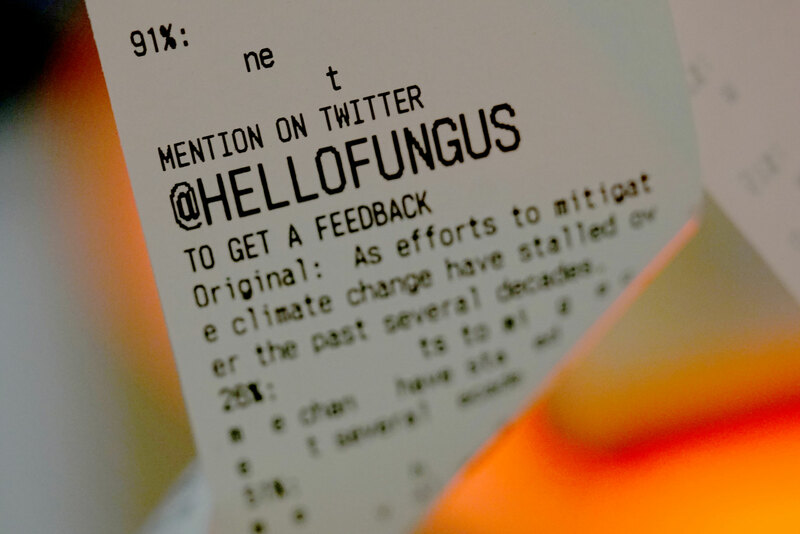 Readouts from the consumption of the physical book and the digital database are visible in the Twitter feed of @HelloFungus and printed out onsite on a thermal printer. The resulting Internet communications and database corruption are directed by microorganisms. 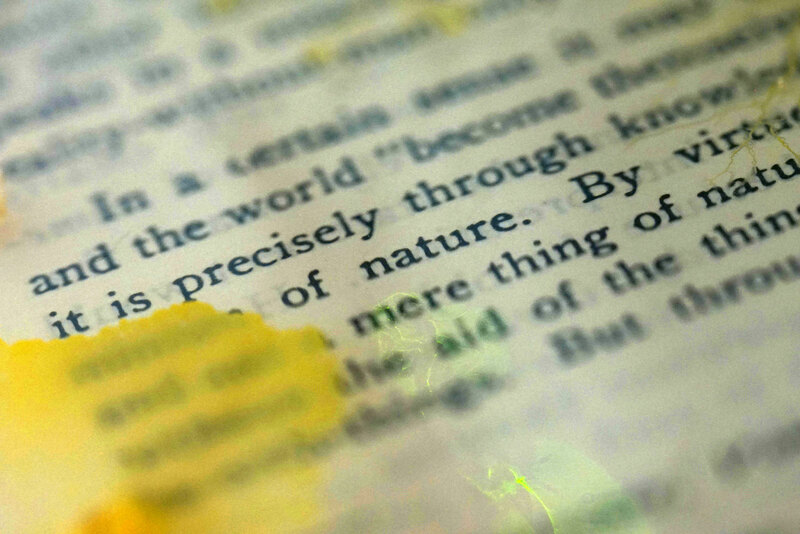 In the process, different types of knowledge systems become crossed – the human knowledge embedded in books that discuss humanity’s relationship to nature, human technological systems for communication of similar concepts, and nature’s knowledge inherent in the organic growth patterns of the living things around us.